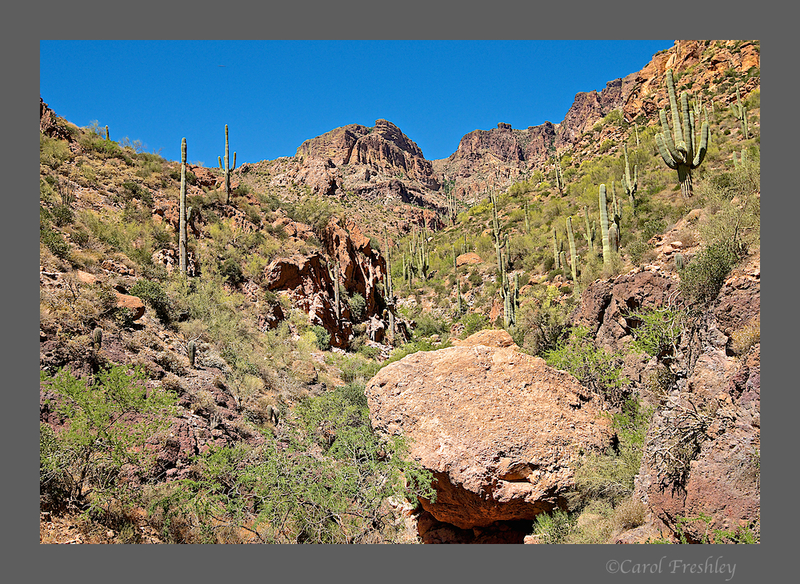 Apache Trail is raw, rugged, wild and unbelievably beautiful. The road is narrow, bumpy, dusty and slow with tight corners and blind spots. It is worth every inch along the way. 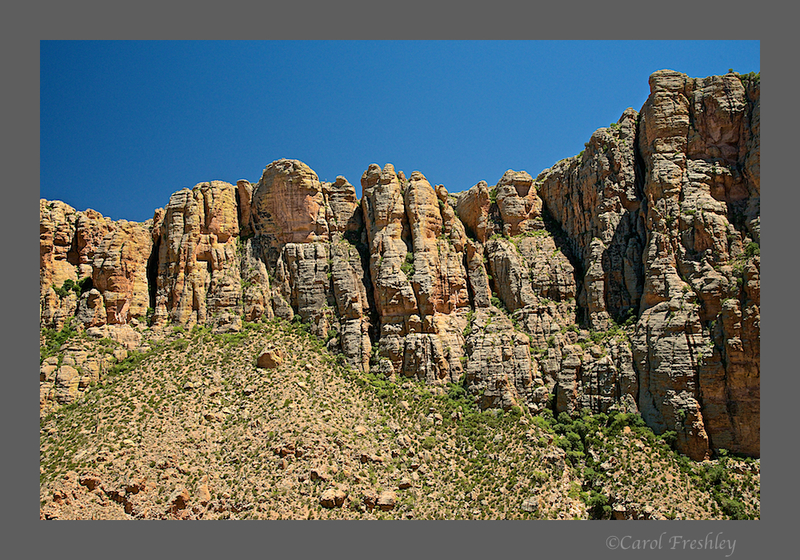 To get to this point, you must start at either Roosevelt Lake and travel south or head up past Canyon Lake and Tortilla Flats and travel north on Highway 88. This time we went north. It is a good idea to stop at Tortilla Flats before heading up for several hours of slow driving and no facilities. Besides, it makes for some interesting photos. There is little traffic on the Trail and few pull-out spots. Even so, Rick who offered to drive his four-wheel vehicle, found several places where we could stop and actually get out of the car. 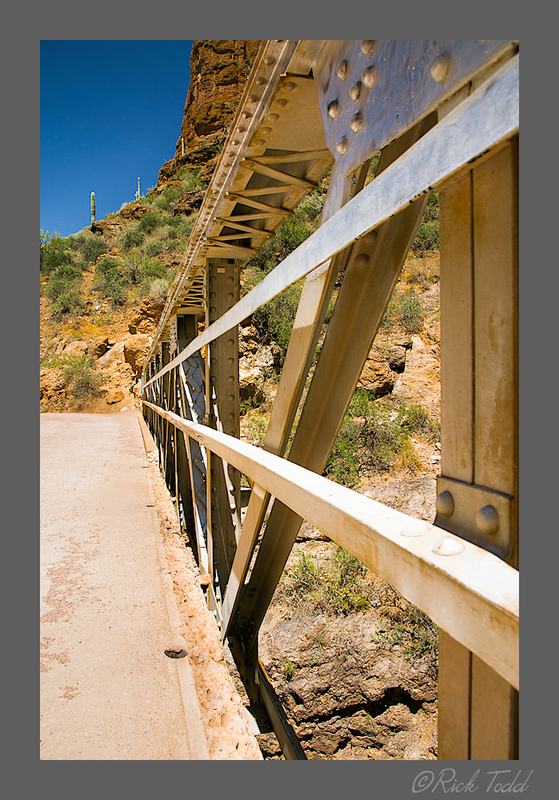 The image below is an artistic take on the bridge at Fish Creek. Other views in the Fish Creek curve. 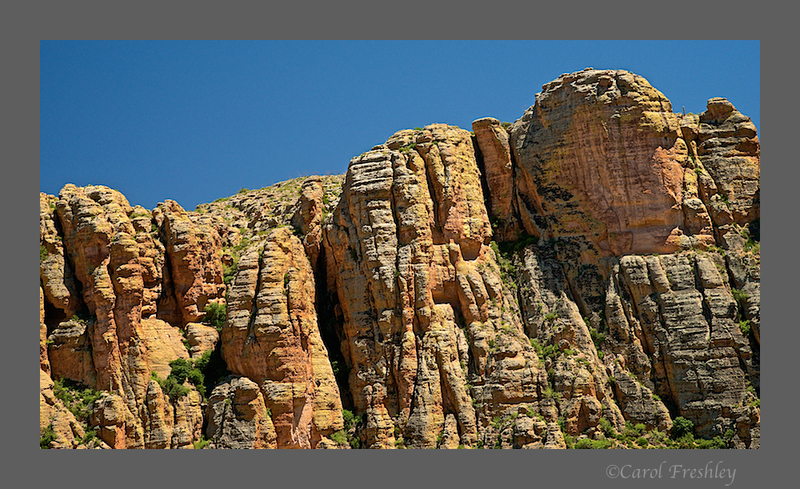 There was no flowing water but we could see where water would come down the narrow canyon and over rocks above us. Bet it is a sight to behold after a good storm. For miles you are treated to the just the majesty of the mountains. There are dots of yellow from the blooming palo verde trees and the saguaro look like they are almost ready to really show off. Finally, we see water at Apache Lake. It is so blue and stands out against our brown background. The beautiful blue does not last. As we drive north we follow the Salt River that is fed by Roosevelt lake and its dam. We go from blue to green. A really, really green! No, this color is not enhanced! We were so pleased to see reflections in what might have been a dull green. But, no it was not, and even the wind did not spoil too much. Finally, we rounded the corner and were treated to the sight of Roosevelt Dam. The road was now paved! Yeah! Better still, lunch or dinner was not too far off! One thing about a scene this big . . . there are many ways to shoot it. Beyond the dam is the bridge that connects to Highway 188. Once again, so many ways to shoot, so many lens to choose from! I just love this reflection!! Too much monkey business? Only my Tom! We headed west towards food. But, of course, we stopped along the way. Somehow the sounds of stomachs growling seemed as natural as the birds and waves of the lake. I am printing out the image below and keeping it for inspiration. This is the foreground I want for a night shooting session. We went to scout for sites and we found several, but Barbara captured the foreground for me to keep front and center. After eating at the Butcher Hook we drove back towards the bridge, catching some late afternoon golden sun. I was struck by the patterns created by the various micro-ecosystems that have been created where Tonto Creek drains into the lake. What a difference some water can make. The area is a rich and productive riparian and we spotted heron and an eagle flew right over us! I gave Rick two whole seconds of warning of the eagle flying towards us. He was the only one sporting glass that would give us a chance at getting the shot. Next time I will give him more notice! I would like to take a moment and thank a very special person. That would be Barbara. You see, she describes herself as a beginner (ahem, look at her images above). She is a beautiful woman but not . . . .
Barbara may not be able to explain how she got her ISO set at 1600, or how to set some fancy shmancy setting on her 'baby' camera, but she gets the shots that will mean a lot more to me in five years than any photo I took all day. Barbara captures meaningful people shots. Thank you so much, Barbara, for being there and making the trip special. Oh, and we love your homemade chocolate chip cookies too! Her caption for the image below was, "See, you don't look fat." Well, just hide it with a tripod . . . In case you can't figure it out, that black thing around my neck is a camera strap! Tom had headed down to the car. "Bring me up my (long list)!" Is this not Tom as you know him? Perfect! Finally, da boyz! Uh, Rick, where is your hat? Tom and I got home about 9:30 pm. What a day we had! We hope you enjoyed following along. Tomorrow we are headed for another adventure!